Star Trek: Asterisk "Spock's Brain"
Some chick steals Spock's brain, so now they have to go lug it back home. Lame. Let's start with how preposterous it is that a single woman can beam onto the Enterprise and knock out the entire crew with the touch of a button. Not all in one fell swoop, mind you, as though she's at the epicenter of a radiating reaction, but one deck at a time, as if her mechanism is integrated into the ship's systems. If that kind of technology exists in the galaxy and is being controlled by people who, as we'll see, don't know how to use it, then we might as well all just give up and go home. Regardless, this chick grabs the Enterprise by the balls and then leaves with Spock's brain. That's right, she surgically removed Spock's brain and left the rest of his body in sick bay and somehow he magically survived. Bones hooked him up to some machines that kept him alive, so now they have to go off and find his brain. They find three planets in one system where his brain could be, and neither of them should have the technology to do what they did. So, on a hunch, they go to the most primitive planet. Once there, they find a bunch of cavemen who attack them with spears and stuff. They scare most of them away, but knock one down to talk to. 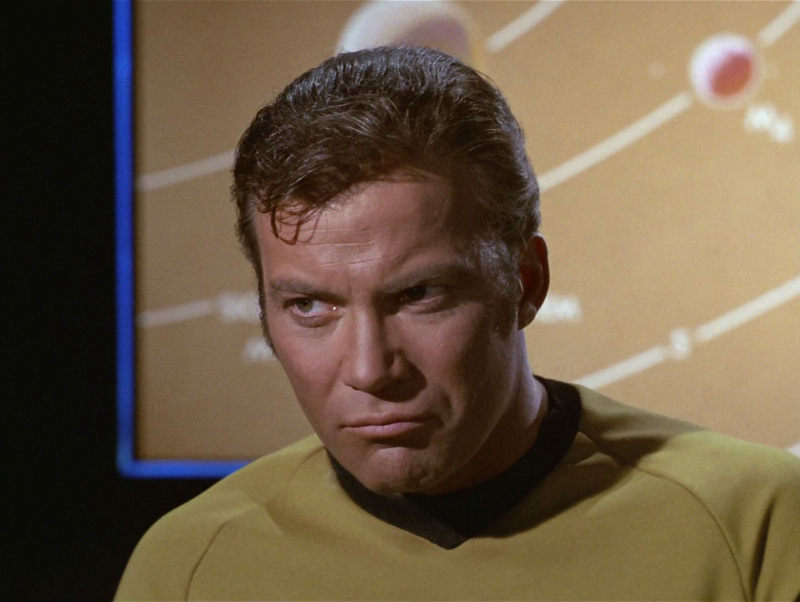 This caveman, instead of offering Kirk starship insurance, says that he doesn't know what women are, but there are some smooth skinned people who bring pleasure and pain who live below the surface. What that has to do with Spock's brain, I'm having trouble figuring out, but Kirk gleans all the information he needs. There are women. He needs to find them. Instead of finding women, they find a cave. There's some strange stuff in there, so Kirk calls on Bones to beam down. Which he does. With Spock. That's right, the person without a brain is walking around with a prosthetic brain. A device that attaches to his head and activates his muscles through the use of a remote control. R/C Spock doesn't move very quickly, but at least he's moving. Bones and R/C Spock make their way along with Kirk and Scotty into the cave and the cave suddenly closes. When the cave closes, it falls like a quick elevator down beneath the surface of the planet. There, they find a lot of tunnels with a lot of technology. And they find women. Unfortunately, these women are just as stupid as the men upstairs. They have no idea how to work the technology, they just know it exists and it works. Well, eventually they get Spock over the communicator. Apparently, his brain is now in control of all of the inner workings of the computer down here. He doesn't know where he is, but the senses that he's connected to a body that stretches out forever. Well, the landing party finds themselves with some pain belts that are controlled by the bracelet the woman is wearing, so when they go try to find Spock's brain, they are immediately taken down by the belts. Except for R/C Spock who is unaffected by pain since that's a function of the brain. Kirk fights through the pain to get a hold of R/C Spock's controller and use him to overpower the chick with the pain control. He grabs her bracelet and the belts pop off. Now it's just her against the landing party. "But I'm just a poor defenseless girl!" This chick has a hard time explaining that she's only smart when she puts a special helmet on. Apparently her ancestors left all this technology behind, but devolved into imbeciles. So, now Spock's only hope of getting his brain back is for Bones to put on the helmet of smartness (the Teacher) and become a supergenius. So that's what he does, despite the protests of the woman because Spock's brain is powering everything that's keeping them alive. 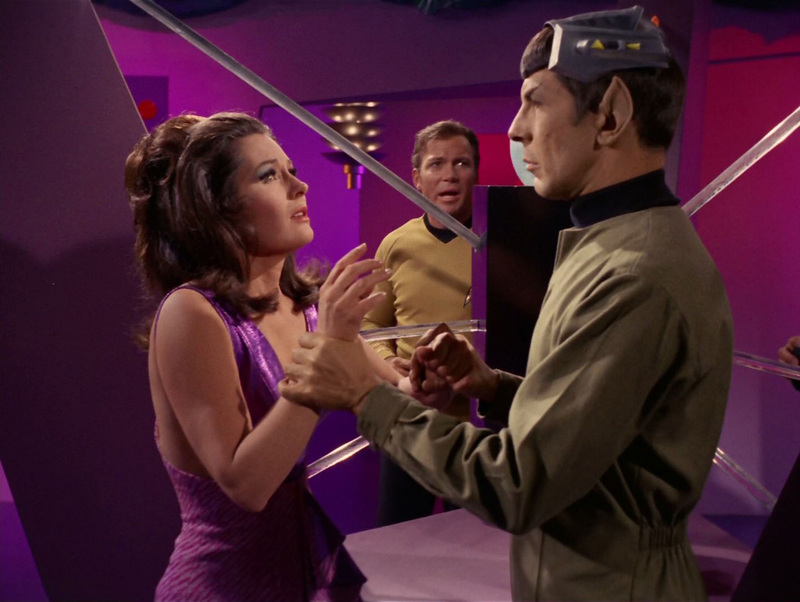 Spock goes back to normal and Kirk explains that the women have to go upstairs with the men and start to make a new life for themselves. 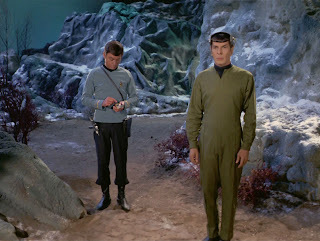 And then Bones regrets connecting Spock's mouth. The end. This episode is famously known as the worst episode in Star Trek history. Or at least of The Original Series. So many logical fallacies, which is ironic for an episode entitled "Spock's Brain".